Profigold launches range of accessories for LED TVs | What Hi-Fi? The two HDMI cables in the new LED TV range use a slimline cable construction while also packing full HDMI v1.4a specification. The new high speed HDMI with Ethernet cables, the PROL1201 and 1202, come in 1m and 2m lengths, and will set you back £50 and £60 respectively. The PROL8703 coaxial antenna interconnect, £35, comes with a 90-degree adapter to allow consumers to make the connection without affecting the amount of space required between TV and wall. Last but not least there's the LED Screen Cleaner package. This alcohol-free cleaner comes complete with a cleaning cloth and anti-static brush for keeping your TV's screen pristine. It's yours for £20. 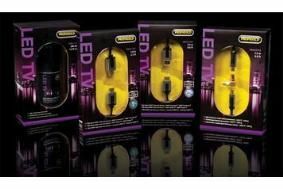 Profigold's new range of LED TV products will be available in November.